Calling it an orchestrated attack to curb dissent, Varavar Rao's family and others blamed both TRS and BJP. 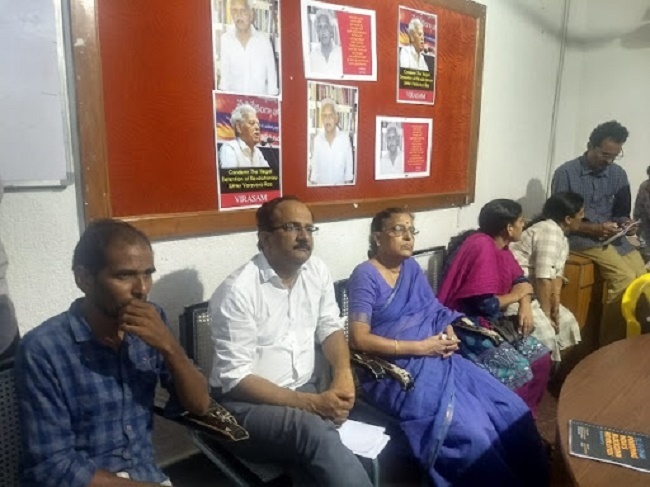 Activists and intellectuals on Tuesday evening condemned the move by the Pune police to conduct searches across Hyderabad and arrest writer and leftist thinker Varavara Rao. Speaking to reporters at Sundarayya Vignana Vedika in Hyderabad, those who had gathered demanded that the police release the writer. While officials refused to comment on the issue, the raids and subsequent arrests were reportedly part of an investigation into plans to allegedly assassinate Prime Minister Narendra Modi, a plot that many of those raided have vehemently denied having any knowledge about. Raids were also conducted in Mumbai, Delhi, Ranchi and Goa, and prominent human rights advocate Sudha Bhardwaj and writer Vernon Gonsalves have been detained. Among those present at the press meet in Hyderabad were Varavara Rao's son-in-law, KV Kurmanath, a journalist with The Hindu, and Kranthi Tekula, a journalist with Namaste Telangana. The residence of Professor K Satyanarayana from the English and Foreign Languages University (EFLU), who is also Rao's son-in-law, was also raided earlier in the day. He could not be present at the press meet, as searches were continuing at his place as of Tuesday evening. "They came at 6 am. We asked them if they had an arrest warrant and they said that they didn't need it. They almost barged in and searched everything. This time, they even raided my daughters' houses. I want everyone to condemn it. He's almost 80 years old. I don't know how he will hold up in prison," said Hemalatha, Rao's wife, as she broke into tears. After hours of questioning the writer at his home in Hyderabad, the police escorted him out, took him for a medical check-up at the state-run Gandhi Hospital and are expected to present him before a local magistrate in the city, before shifting him to Pune. Kurmanath, whose house was also raided, told the gathering, “As usual, I went to walking at Indira park, when 6 to 7 people in civil clothes rounded me up and seized my phone. They took me in my car. The entire task was carried at 2 am, I could understand their language. They just did the raid at 6 am. Apart from seizing my phone and cutting my landline, they seized my laptop which had all my children's photos. I don't even have a copy of it. The Telangana police also aided them in this atrocity. When police asked me about a book, I told them that it was a book about a Telangana martyr. But, the Telangana police said to them that the book was that of a Maoist." Those who had gathered, also lashed out at Telangana Chief Minister K Chandrasekhar Rao. A letter in Marathi was also handed to Kurmanath, that sought for his arrest, for ‘aiding’ Varavara Rao's activities. Speaking to TNM after the event, Kurmanath added, "This entire plot is devised to garner Hindutva support. Modi is already losing support and he wants to gather sympathy by stating that a Hindu leader is going to be killed. This Bhima Koregaon, an assertion of Dalits is a barricade to the Hindutva politics, so they want to taint it." "It is an orchestrated attack to curb dissent. Both TRS and BJP, which is losing popularity, keeping elections in mind, have done this. The government doesn't want activists to side with Dalits, Muslims and other marginalised communities. The assassination letter was fabricated by them (police), and used as evidence to arrest innocent people," said Professor C Kasim from the Osmania University. "After several hours of harassment, before leaving, they gave a panchanama document, which was written in Marathi. Panchanama should be written in a language that the accused can understand. We don't know what's written in it. They could have written that there was a bomb recovered also," said Venugopal, the editor of Veekshanam. Meanwhile, in a video statement released online, CPI national secretary K Narayana said, "We strongly condemn the arrest of well-known Left intellectual Varavara Rao. How can the Pune police come here conduct a search? What is the state government doing and behaving as if nothing is happening? From when the Modi-government has come into power, they are trying to kill intellectuals." "They killed Govind Pansare, Gauri Lankesh and Kalburgi and they have also imprisoned GN Saibaba. They have arrested Varavara Rao only with the intention of killing him. Is the PM really that weak, to be killed so easily?" he asked. In June, police in Pune had allegedly recovered a letter mentioning a plan to assassinate Modi from the house of one of the five persons arrested in connection with the Bhima Koregaon violence. The letter written by a person identified only as 'R' reportedly mentions a plot to kill the Prime Minister on the lines of former Prime Minister Rajiv Gandhi. It also referred to requirement of Rs 8 crore to purchase a M-4 rifle and four lakh rounds to execute the plot. The letter reportedly mentions Varvara Rao's name. Varvara Rao, who heads 'Virasam', an association of revolutionary writers, had strongly denied the allegations. He had said that all five arrested in the case were working for the betterment of downtrodden. He had also alleged that the letter was planted.